We were treated to Matthias’ Ice Breaker speech. He chose to share with us a travel experience he had in New Zealand which transformed his outlook on life and his future. It was a really impressive and engaging story. So much so that his evaluator, Heike, advised him to make it a part of his branding. My speech project was from the Persuasive Speaking manual. 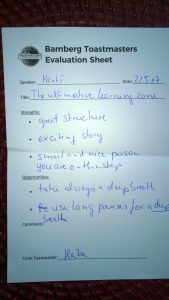 My objective was to motivate the club to create the ultimate learning zone for leadership and communication skills. The basis of the ideas came from Eduardo Briceno’s TED talk, How to Get Better at The Things You Care About. I received excellent feedback from my evaluator Alexandra. In addition I received constructive feedback from all the other members. This valuable feedback and support of the members contributes to making a Toastmasters club an ideal ‘Learning Zone’ that Briceno talks about. That evening we were 18 all together. Many of our 8 guests got to practice thinking on their feet in Table Topics. At the beginning of the meeting we voted Matthias and Alexandra in as a members. At the end of the meeting Tina and Bianco joined the club. Welcome Tina and Bianca. Join us at our next meeting on Monday June 12.